Social media trends: Is Vero a flash in the pan or challenger to the social media status quo? Vero has risen in popularity as a user-friendly alternative to Instagram, rising to nearly 3 million. Yuval Ben-Itzhak CEO of Socialbakers, looks at what the 3-year old social network has to do to compete with Snapchat and Instagram. App developers would likely agree with Oscar Wilde that the only thing worse than being talked about is not being talked about. An incredible amount of energy and creativity gets poured into designing, developing, and marketing new apps, only for many of them to sink without trace because they did not capture the public mood. That’s why the buzz around Vero, the not-so-new photo-sharing app will be welcomed by its founder, Ayman Hariri, even if much of the coverage focuses on the company’s technical problems, questionable business model, and the opacity of its metrics. On paper, Vero seems like a potentially powerful challenger to market leader Instagram, especially since it addresses many of the things that have irritated the latter’s users in recent months. These include downtime – that cardinal sin for any social media site – as well as changes to the algorithm that decides which images are shown, and UX fails such as having to continuously pinch a picture in order to zoom. By contrast, Vero has won admirers not by being radically different from Instagram, but by focusing on giving consumers the functions they desire. These include a reverse-chronological feed, the ability to designate connections based on their relationship to the user (and so control who sees what), its stated commitment to strong privacy policies and minimal data collection, and functionalities such as the ability to share text and URLs. None of these functions is especially revolutionary in itself; together, however, they add up to a create a sense that user is fully in control of their feed and their data. The key to a successful social platform will always be simplicity and a sense of user empowerment and control, which is why relatively minor changes to algorithms and functionalities often leads to such a disproportionate backlash from loyal users. The question is, does this add up to a social site that will disrupt the social media landscape and eat significantly into Instagram’s market share? There are plenty of reasons to temper our enthusiasm about the platform. Vero certainly has some traction, having risen spectacularly to over three million users. This pales in comparison to the 800 million users that Instagram can boast today. Instagram also has a proven track record of fast innovation, which means that the Vero designers can’t sit on their laurels for a second. Meanwhile, Vero’s app reputation on Google Play is relatively low, something they will need to improve quickly if they want to grow. In fact, data from Socialbakers shows that brands, celebrities, music and film production companies, bloggers and YouTubers - 191,3k Facebook pages, 82,6k Twitter profiles and 48,6k Instagram profiles – are not discussing the platform. The term “#vero” was only present in 34 Facebook, 68 Twitter and 29 Instagram posts, respectively. While this doesn’t take into account conversation about the platform that is happening on people's personal profiles, it certainly indicated that the major influencers and brands are not paying attention to the app yet. 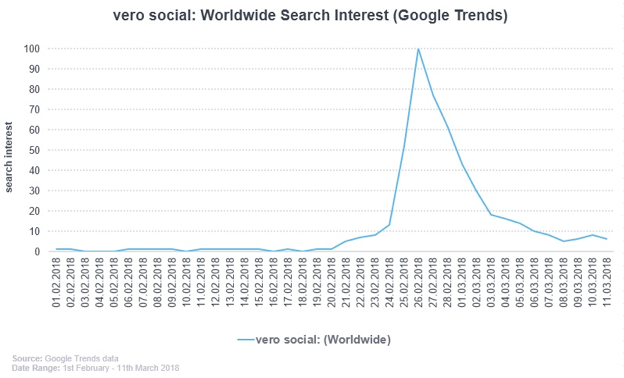 The below chart also shows the search interest data taken from Google Trends which indicates that Vero might be leaving the spotlight as quickly as it appeared. On the plus side, audiences are constantly changing and looking for the next new thing and Vero prides itself on giving its users a more authentic form of self-expression and authenticity, which is what users are looking for today. At the moment, Vero has the luxury of being able to focus on growing its market share rather than worrying about tinkering with the app to appease advertisers and other stakeholders. Yet the stark realities of capitalism will bite sooner rather than later, and Vero has made it clear that its business model is based on a subscription model. People have become used to social media being “free” (or, rather, to accept that they themselves are the product rather than the customer), and it’s yet to be seen whether they will pay for the pleasure of using the service. Certainly, a subscription model, no matter how small the fee, raises serious questions about future relationships with advertisers, as people are likely to resent being asked to pay twice – once through subscriptions, and again through advertising content. It may be that Vero finds that the subscription model works for them, but if they do decide to go down the advertising route, they will need to clarify their approach to data and metrics. At present, Vero’s policy of gathering minimal data on users makes them an unattractive proposition to marketers, while there is still a lack of clarity around their metrics (MAU, DAU and engagement per user). What’s more, there have been many complaints from people trying to delete their profile, and this leads to questions about the validity of Vero’s MAU numbers – are they committed users, or merely people who signed up to try the service, but now no longer want to engage with it? Historically we have seen Facebook overtaking MySpace and many thought that Snapchat would overtake Facebook; however, we have seen many apps hit the wall when it comes to innovation of content types and building monetisation models that don't scale. What is not clear is whether Vero’s sudden popularity is a knee-jerk reaction to something users don't like with Instagram or whether the app really does have legs. It's definitely positive that Vero is picking up traction and is offering its users an ad-free environment, but what they need to remember is that consumer products need to evolve and innovate to remain relevant, as well as to monetise their engagement. Vero’s founders will be enjoying the attention, and they deserve their moment in the spotlight. Whether we’re still talking about them in 12 months’ time depends much less on the app itself than it does on the company’s ability to create a long-term business model.